The Huawei Y6 is more than a smartphone; it's a fashion piece. Owing to its classic compact frame and sleek body, the Huawei Y6 white colored phone not only offers an ergonomic, user friendly experience, but also assumes a stylish appearance that will make heads turn and conversations start. Let's find out why the Huawei Y6 reviews are great! It has a 5inch HD IPS display that makes up 72 percent of the whole phone’s size. This display renders content in brilliant colors and real contrast, making your viewing experience one that is captivating and immersive. The Huawei Y6 cameras are the star of the device. They enable you to snap all your adventures, be it night or day, with surprising clarity. Its 8MP camera has a wide aperture, which makes it easy to click high quality pictures even in low light. That being said, the BOX integrated sound chamber and two, built in speakers create an audio experience that truly strikes a chord. It makes sure you never miss a single detail and offers 150 percent of volume enhancement. Based on the Android Lollipop operating system, the Huawei Y6 smartphone delivers a smooth and efficient user experience without draining your battery power. In addition, the Huawei Y6 features an 8GB onboard ROM that offers a good storage space. Its 1GB RAM enables great multitasking speeds that get the job done with glitch free ease. With its 3G and WiFi support, all that is left to do is surf the Internet and download all your favorite apps without a hiccup. 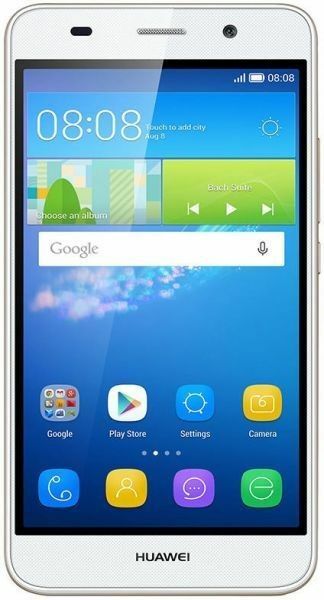 The white colored Huawei Y6 smartphone offers much more than basic smartphone features. It delivers a performance speed that lets you complete tasks without a glitch. Its Qualcomm MSM8209 Snapdragon 210 chipset houses a Quad Core 1.1GHz processor that works at giving you a great speed and lag free performance. The Huawei Y6 white colored smartphone is fitted with an 8MP FF rear camera that lets you capture wonderful moments in bright clarity. It incorporates a wide aperture that makes it possible to click beautiful, high quality images in low light environments. This camera supports maximum resolutions of about 3264 x 2448 pixels, and offers geotagging, touch focus, and face detection features. The white colored Huawei Y6 smartphone offers a smooth and fast user experience without straining your battery power. Its 2200mAh battery provides a good runtime, so you can watch, play, or read all night long. 92.9% of users recommend this product to a friend.